50,000 points Receive 50,000 bonus points - a $500 value - after you make at least $3,000 in purchases in the first 90 days of account opening. Flat-rate rewards. This card's 1.5X points on purchases other than travel and dining beats out other top travel cards. There's a 50,000-point sign-up bonus after a $3,000 spend within the first 90 days of card membership. See more of the best rewards credit cards of 2019. 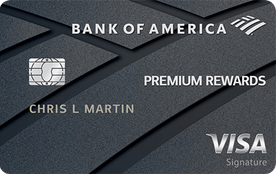 Our take: The Bank of America Premium Rewards card combines the features of a cash back card with the features of a premium travel card for a great value. Ratings and reviews provided by issuer as of 2018-10-03.